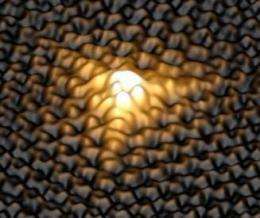 This 3D image, obtained with a scanning tunneling microscope, shows a single isolated atomic vacancy. The scientists identified the presence of a sharp resonance peak on top of individual vacancies, which can be associated with a magnetic moment. Image credit: M. M. Ugeda, et al. ©2010 APS. (PhysOrg.com) -- Physicists have found that, by removing individual atoms from a graphite surface, they can create local magnetic moments in the graphite. The discovery could lead to techniques to artificially create magnets that are nonmetallic and biocompatible, as well as cheaper and lighter than current magnets. The scientists, Miguel Ugeda, Ivan Brihuega, and José Gómez-Rodríguez, all from the Autonomous University of Madrid, along with Francisco Guinea from the Institute of Materials Science of Madrid, have published the results of their study in a recent issue of Physical Review Letters. As the scientists explain, creating atomic vacancies in graphene-like materials by removing atoms has a strong impact on the mechanical, electronic, and magnetic properties of the materials. In previous studies, researchers have investigated the effects of atomic vacancies on the properties of the material as a whole. In the current study, the scientists wanted to probe deeper and see what happens at each individual vacancy. In their experiments, the physicists used highly ordered pyrolytic graphite, which consists of stacked graphene sheets that follow the AB-AB stacking sequence. This means that one graphene sheet (B) is slightly shifted with respect to the upper layer (A) in such a way that half of the carbon atoms of the upper sheet A have a carbon atom located exactly below them, while the other half do not. First, the researchers peeled off some upper graphene sheets in ultra-clean environments in order to ensure that the top graphene sheet, i.e. the graphite surface, was completely free of impurities. Then they created single vacancies by applying low-energy ion irradiation, using just enough energy to displace the surface atoms and produce atomic point defects. Using a homemade low-temperature scanning tunneling microscope, the scientists could identify the presence of a sharp resonance peak on top of individual vacancies. The resonance peaked around the Fermi level, which has been predicted in many theoretical studies but has never been experimentally observed before now. As the scientists explain, the resonance at a vacancy can be associated with a magnetic moment. The vacancies cause nearby electron spins to align due to repulsive electron-electron interactions, which leads to the formation of the magnetic moments. In addition, vacancies at different sites induce different kinds of magnetic moments, which can interact with each other. This interaction points to the possibility of inducing a macroscopic ferromagnetic state in the entire graphite material simply by removing random individual carbon atoms. Overall, the results not only confirm the accuracy of theoretical models, but also have further implications. For example, the observed resonances may enhance graphene’s chemical reactivity. In terms of applications, the results could lead to innovative magnets. “To create a magnet from a pure carbon system is a tantalizing possibility since this would be a metal-free magnet and thus optimal for applications in biomedicine,” Brihuega said. “In addition, it should be much cheaper to produce than conventional magnets since, to give some numbers, a ton of carbon costs around a thousand times less than a ton of nickel ($16 vs. $16,000), a commonly used material in actual magnets. In the case of graphene systems, one would also have flexibility and lightness as additional advantages; but to date, the total magnetization reported for these systems is very low when compared with the strongest existing magnets. How Perfect Can Graphene Be? This could also lead to novel methods for the creation of entirely new carbon nano structures, such as geodesic buckey domes, thorugh the attractive properties of quantitatively balanced, as opposed to random, isolated assymmetries in the graphene sheet. Ah, well....a ton of carbon isn't a ton of graphene. Processing cost for making a ton of graphene is still substantially higher than $16,000 (and likely to remain so for a while). Would be interesting to know how strong these carbon-magnets are compared to other types of magnets by volume (or weight). It seems that the only thing graphene can't do (yet) is clean the coffee pot. Fascinating stuff. Also different stacking sequences should be tried. Magnetism is either a product of circular electron movements or of inhomogeneous electron spin alignment. With the proper geometry these effects may become more pronounced. replacements for bones, artificial retinas etc etc. Everything will be made of carbon nanotubes and graphene! It seems that the only thing graphene can't do (yet) is clean the coffee pot. Why in the world would you want to clean the coffee pot? Don't you know that better tasting coffee, and better tasting tea, too, is poured from well used coffee and teapots? Lasers are used extensively in eye surgery to remove unwanted material from the eye or reshape the eye lens. These lasers use pulses of very intense radiation to literally blast away material. its amazing what scientists are achieving in our generation. So far authors showed that if they create dangling bond-it has unpaired spin, oh really?? It is nic epicture but result is completely trivial and has nothing to do with magnets, amorphou silicon has lot of free spins and no ferromagnetism. Magnetic moments must align to make a magnet, that i snot yet shown for carbon.